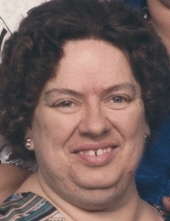 Patricia Ann Adkins, 76, passed away on March 9, 2019. Pat was born in Akron, OH on Jan. 12, 1943 to the late Ernest and Gertrude (Hyde) King and lived in the Akron area most of her life but most recently in Barberton. She was a very loving and kind person who had an especially soft heart for all animals. In addition to her parents, Patricia is preceded in death by her husband, Bill Neal Adkins; sisters, Lillian Wilson and Arlene Mauk; brother, Ernest King, Jr.; and special uncle, Floyd Hyde. She is survived by, sister, Betty Dotson; special niece, Barbara Mauk, friend, Michael Bukovac; many niece and nephews; great nieces and great nephews; and beloved dog, Penny. Graveside service will be Monday, 1:00 pm at Northlawn Memorial Gardens. You are invited to hbm-fh.com to view Patricia's tribute wall, offer condolences and share memories.